I have become an impulse buyer with new products to bake or cook with. This is not a bad thing in any way, but it does tend to give me mixed results. It also gives me quite the nudge to use it when I keep pushing it aside in the fridge until the date has just about passed! Anyway, one of the last things I bought that had an expiration date on it was silken tofu. I had every intension of making "ice cream" or pudding, but I also had a container of rice alternative cream cheese that needed to be used...so I thought maybe cheesecake. My oldest son loves cheesecake (and egg nog) and I thought that if I could incorporate some good for you tofu into his cheesecake then I would be super mom, right...Well, not so much. I used this recipe for eggnog cheesecake (which the illustrator and I thought had a really good flavor), but I think I used the wrong kind of silken tofu. I think you have to use the kind that is not refrigerated. Everywhere I have looked has pointed out that you need to use the kind in the box. My local grocery store does not sell that type, so I used what I had. The flavor was very good and the pie was creamy in texture, but I was looking for a more sturdy cheesecake consistency. It was more like a cheese pie (I think due to the type of tofu I used) and I will be making this again and trying the other type of tofu in it. I like the idea of the oatmeal cookie crust, but I think I made mine too thick. I used an old school pie plate and it was not big enough for the pie. I had a lot left over. Incidentally, I baked the left overs in a bowl and I think it would have made a great "creme brulee", but I was the only one eating it and by the 5th piece...I had enough (I mean how much pie can one girl eat?). So, I will explore this again and try to use a different product. I have not stepped outside of the box for so long when it comes to baking that I have enjoyed trying out new products! It definitely makes life (at least with food) more interesting! 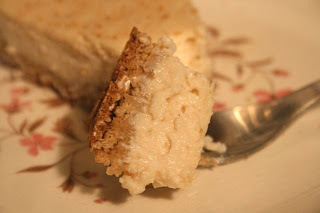 Ooo eggnog cheesecake with an oatmeal cookie crust! That sounds so good. Thanks for reminding me that I wanted to try making a vegan cheesecake with the tofutti! Veggiegirl-I have to impulse buy! It encourages me to experiment and I love to try new things! Eatme_delicious-I want to try a cheesecake with tofutti too! Let em know how it turns out! I made this cheesecake last night and my hubby to be felt the same way you did about the consistency. I would be interested to know how you changed the recipe to make it more like cheesecake. 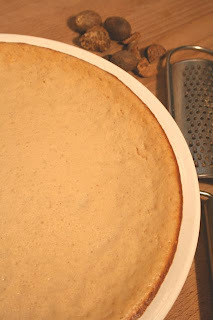 I plan to post my cheesecake on my blog this week. I ate my piece before I could take a picture.